In the past decade there has been a dramatic interest in cosmetic dentistry. Here at Tru Dental we realize that having a healthy, bright, beautiful smile enhances our appearance and allows us to smile with confidence. Thanks to the advances in modern cosmetic dentistry, we are able to improve our teeth and smiles with quick, painless and surprisingly affordable treatments. • Change the size, shape, and alignment of certain teeth. • Fill in unattractive spaces between teeth. • Improve or correct bites. • Lighten or brighten the color of teeth. • Repair decayed, broken, cracked, or chipped teeth. • Replace old, unattractive dental treatments. CEREC® is comprised of several computer-assisted design (CAD) tools and a milling machine that creates custom ceramic restorative devices. CEREC® can make almost any ceramic restoration to order, meaning the dentist can place it immediately. The first step in the procedure is to prepare the tooth. The dentist removes all tooth decay and shapes the tooth making it slimmer at the base. Next, an impression is made using a covering of titanium dust. This dust allows the camera to take a highly detailed picture of the tooth. Images are formulated with the CEREC® camera. CEREC® optical imaging utilizes an infrared wavelength. The image is transposed onto the computer screen. It is here that the dentist is able to view the tooth from every angle and design the final restoration. When the design is complete, it is transmitted to the milling unit. The dentist chooses a block of ceramic that matches the color of the teeth. This ensures that the restoration will be very natural looking. If you have questions or concerns about CEREC®, please ask Dr. Trujillo or her team. Dental implants act as artificial roots (usually titanium) that are placed into the upper or lower jaw bone. Dr. Trujillo works with several oral surgeons and periodontists that surgically place the implant. Then, after the implant becomes stable in the bone, Dr. Trujillo can restore the implant screw with a restoration to look like a natural tooth. Teeth attached to implants are very natural looking and often enhance or restore the patient’s smile! Dental implants are very strong, stable, and durable and will last many years, but on occasion will have to be re-tightened or replaced due to normal wear. Dr. Trujillo will provide care instructions when your treatment is completed. Good oral hygiene, eating habits, and regular dental visits will aid in the life of your new implant. An inlay restoration is a custom made filling made of composite material, gold, or tooth-colored porcelain. Porcelain inlays are popular because they resemble your natural tooth. A porcelain inlay is made by a professional dental laboratory and is permanently cemented into the tooth by Dr. Trujillo. While the tooth is numb, Dr. Trujillo will remove any decay and/or old filling materials. The space will then be thoroughly cleaned and carefully prepared, shaping the surface to properly fit an inlay restoration. A temporary filling will be applied to protect the tooth while your inlay is made by a dental laboratory. A composite (tooth colored) filling is used to repair a tooth that is affected by cavities (decay), cracks, fractures, etc. The decayed or affected portion of the tooth will be removed and then filled with a composite filling. You and Dr. Trujillo can discuss the best options for restoring your teeth. Composite fillings, along with silver amalgam fillings, are the most widely used today. Because composite fillings are tooth colored, they can be closely matched to the color of existing teeth, and are more aesthetically suited for use in front teeth or the more visible areas of the teeth. Composite fillings are usually placed in one appointment. While the tooth is numb, Dr. Trujillo will remove decay as necessary. The space will then be thoroughly cleaned and carefully prepared before the new filling is placed. If the decay was near the nerve of the tooth, a special medication will be applied for added protection. The composite filling will then be precisely placed, shaped, and polished, restoring your tooth to its original shape and function. We will provide care instructions at the conclusion of your treatment. Good oral hygiene practices, eating habits, and regular dental visits will aid in the life of your new fillings. Although there are several types of crowns, porcelain or ceramic (tooth colored) are the most popular. They are highly durable and will last many years, but like most dental restorations, they may eventually need to be replaced. Porcelain and ceramic crowns are made to match the shape, size, and color of your teeth giving you a natural, long-lasting beautiful smile. 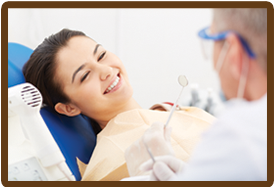 A crown procedure typically requires 1 to 2 appointments. Your first appointment will include taking highly accurate molds (or impressions) that will be used to create your custom crown. A mold will also be used to create a temporary crown which will stay on your tooth for approximately two weeks until your new crown is fabricated by a dental laboratory. While the tooth is numb, Dr. Trujillo will prepare the tooth by removing any decay and shaping the surface to properly fit the crown. Once these details are accomplished, your temporary crown will be placed (if this is a 2-appointment procedure) with temporary cement and your bite will be checked to ensure you are biting properly. We will provide care instructions and encourage you to have regular dental visits to check your new crown. There are several types of bridges. You and Dr. Trujillo will discuss the best options for your particular case. The “traditional bridge” is the most popular type and is usually made of porcelain fused to metal. Porcelain fixed bridges are most popular because they resemble your natural teeth. This type of bridge consists to two crowns that go over two anchoring teeth (abutment teeth) and are attached to pontics (artificial teeth), filling the gap created by one or more missing teeth. At the second visit, you permanent bridge will be carefully checked, adjusted, and cemented to achieve a proper fit. Occasionally Dr. Trujillo may only temporarily cement the bridge, allowing your teeth and tissue time to get used to the new bridge. The new bridge will be permanently cemented at a later time. We will provide care instructions at the conclusion of your treatment. Proper brushing, flossing and regular dental visits will aid in the life of your new permanent bridge. 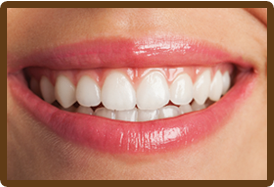 Veneers can completely reshape your teeth and smile. Getting veneers usually requires two visits to complete the process, with little or no anesthesia required during the procedure. The teeth are prepared by lightly buffing and shaping the surface to allow for the thickness of the veneer. A mold or impression of the teeth is taken and a shade (color) will then be chosen by you and Dr. Trujillo. 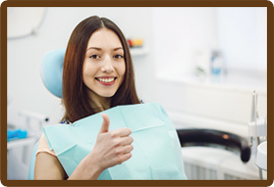 We will provide care instructions for veneers. Proper brushing, flossing and regular dental visits will aid in the life of your new veneers. Teeth whitening is not permanent. Touch-ups are needed to maintain the desired color and will vary depending on habits such as drinking coffee, tea, or wine or smoking. You may experience tooth sensitivity during the time you are whitening your teeth, but it will subside shortly after you have stopped bleaching. We will provide care instructions for your teeth and trays, and be encouraged to visit Dr. Trujillo regularly to help maintain a beautiful, healthy, white smile.